Vintage hardcopies are always impressive when complete, although finding complete ones is a daunting and costly endeavor at times. 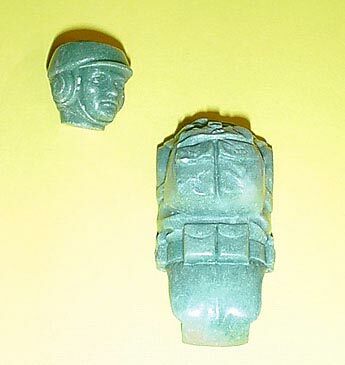 What you see here is a hardcopy head and torso half for the ROTJ line's Rebel Commando cast in Dynacast. Collectors who are familiar with hardcopies will immediately notice that the torso hardcopy is a tad different from the hardcopy parts they are often exposed to. Based on the two piece torso of this figure, we can immediately establish that it was originally sculpted in acetate. Figures sculpted in this material are accomplished through the use of a milling machine. This process always leads to a sculpt which is assembled via a two piece torso. 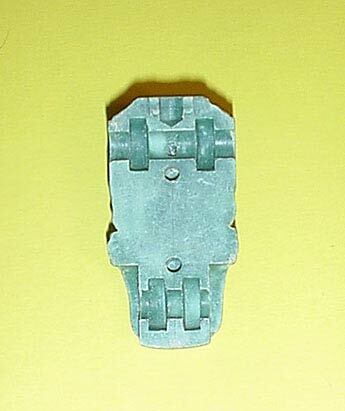 The photo above shows the grooves that held the limbs in place, which carried over from the acetate sculpt. Because the stances of figures sculpted in acetate were sometimes deemed too "stiff", the figure was often slightly modified in wax to give it a "looser" stance. So, having said that we can conlcude this hardcopy torso half was created using a silicone mold from the initial acetate sculpt.